As the end of the year approaches and Christmas is just on the horizon its always nice to take some time out to soak up the festive season and spend some time with loved ones! It's no surprise that since bringing another human in to the world holidays have changed (just a bit) and its a bit of an adjustment. We were wanting to get away and go to somewhere not too far away with everything close by. I looked at Air B&B and Center Parcs but we decided that Ribby Hall was the place to be! 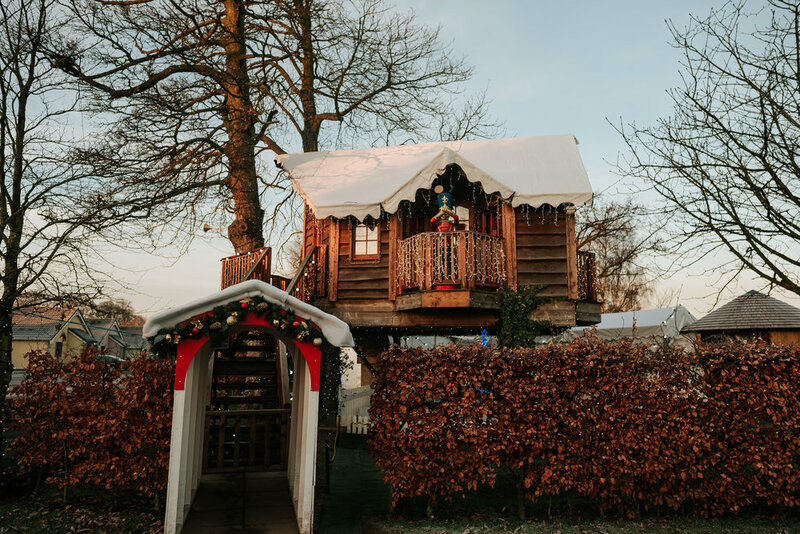 We stayed on a midweek break in December during Ribby's Winter Wonderland, which meant all the lights were up around The Village and Father Christmas was in residence in The Tree House (Exciting)! We stayed in a Sapphire cottage which is located around Fisherman's Reach; a small fishing lake. The cottage was all on one floor with a double, a twin and a room with a bunk bed in it. 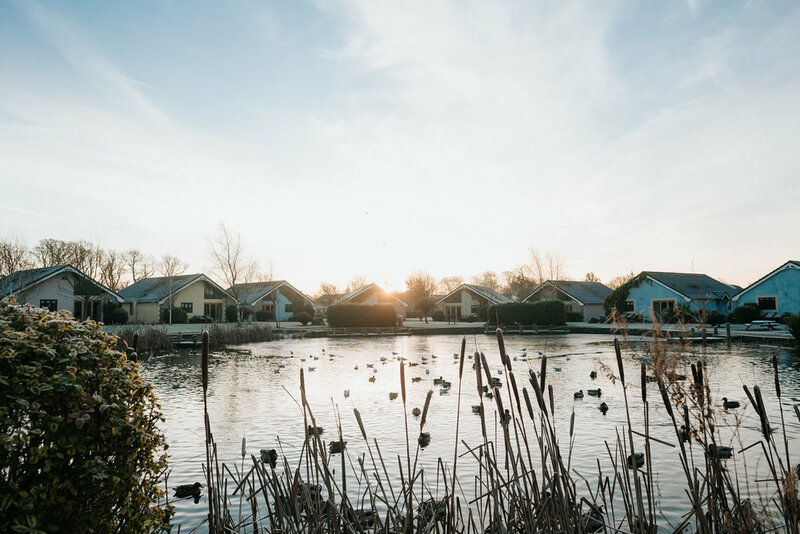 The bi-fold patio doors opened to the beautiful lake where the ducks greeted us on a daily basis (big hit with the toddlers!) and the back door opened on to Wild Discovery where the Donkeys came to visit! We were travelling with our friends and their little boy who is a few months older than our little boy Rupert who is 18 months. The main thing that I LOVED about Ribby is that it was so EASY! We arrived and there were already two travel cots up with bedding in them and two high chairs (free of charge) - less things to remember to pack and more time to start enjoying ourselves! Our first day and we have a little lie in - the beds are very comfy, followed by a lazy breakfast whilst the boys are very entertained by all the ducks at the window. 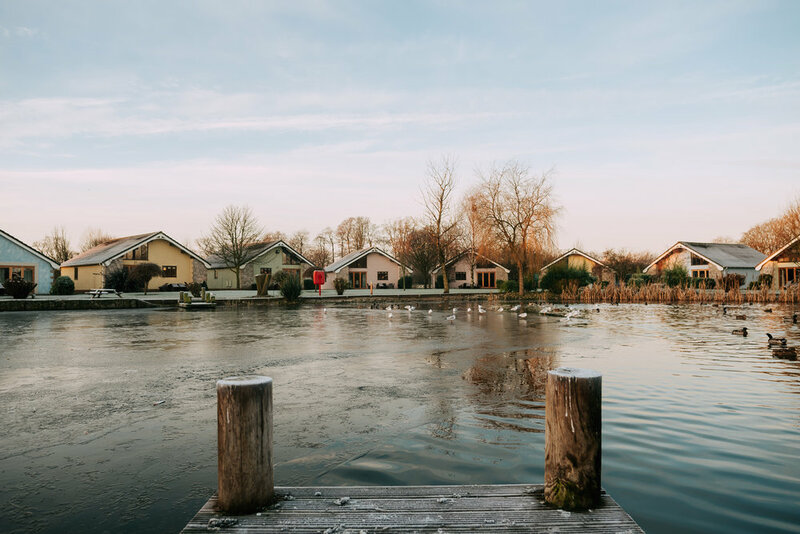 We were really lucky to wake up to a beautiful frosty scene on Fisherman's Reach, it looked gorgeous! So once we are fed and watered we head out for a walk along the woodland trail. The full trail starts across from The Island activity centre and ends at Wild Discovery. Due to being there at Christmas on one section of the Woodland Trail there was a Christmas Present hunt - they change this seasonally so at Easter they have an Egg trail etc. Its a nice easy walk - the full trail that we did wouldn't be fit for prams all the way round. All in all I think it took us an hour, so nothing too challenging but its also a great way to see The Village. On the way back we stopped for a cheeky Starbucks Coffee to warm ourselves up. Back at the cottage the boys go for a nap and we put our feet up and enjoy a Nespresso coffee. One of the little treats you get when you have one of the premium accommodation is a Nespresso Coffee machin - little tip; all the big supermarkets including Aldi which is a 2 minute drive away sell pods for Nespresso machines. So if you are staying in a Sapphire cottage take some with you for when you run out of the ones provided by Ribby. For Dinner we headed off to The Tapas Restaurant and Bar. As those of you with a toddler will know dining with them can be quite an experience depending on what mood they are in, so going to a nice restaurant is always running the gauntlet a little bit, however we figure as its a family friendly holiday village we will be fine! It was a lovely dining experience, there were other famillies which is always a re-assuring sight, and we were sat slightly out of the way which was lovely. They had a great childrens menu and we ordered from The Tapas Menu. The only thing that confused us a little was that it felt like it didn't know what it wanted to be as there was Tapas, Pizza, main courses and then a market menu.... that said the food we ordered was delicious (and the wine!) and its fair to say a great time was had by all! Wednesday was declared our fake Christmas Day and was fairly action packed! We got up in the morning and Caroline and I took Rupert and Theo to Messy Play in the Bar and Grill. The boys loved all the paint - especially Theo who ended up green from head to toe! Its nice to be able to do something like this and not worry about cleaning up afterwards - although I am fairly sure that Caroline was finding green paint on Theo for at least another week! Once we were all cleaned up we went off to see Santa at The Tree House! This is the first time I have taken Rupert to see Santa and it was so lovely! I won't ruin any of the surprises but it really was fab. After all that the boys were exhausted (and so were we! ), so they went off to bed and Caroline and I went to The Spa Hotel to enjoy the Aqua Thermal Journey. It's a while since I have been and done the Aqua Thermal at The Spa Hotel, so it was lovely to see that they had some fab new additions. They already had a large hydro-pool and quite a few heat experience rooms such as sauna, salt inhalation room etc, however the additions are outside at the back of the building. I LOVED the new Himalayan Salt Sauna which is outside and has a glass front which looks out on to views. It was really cosy as the weather was so awful outside! From there we went to the new hot tub in the lower zen garden which is also really nice! They also have a new outdoor bar and experience shower. We had such a lovely couple of hours out and would recommend to everyone! It starts from just £34pp and you can add lunch, dinner or afternoon tea. We would have liked to have a treatment too but they were fully booked - so note to the wise - book your treatments well ahead of your stay!! Excuse the rubbish phone pics but cameras and water don't mix. On our return to the cottage our lovely friend Rick had cooked a full Christmas Dinner! And as if that wasn't Christmassy enough we had booked a reindeer visit from Pringles. I don't know who was more excited me and Caroline or the children! Ok, it was me! You have to book this in advance at reception and he came to see us at the cottage at 5pm. Handlers from Wild Discovery bring him to your cottage along with some food and you can feed him, pet him (carefully) and have a picture with him. We really enjoyed this - although Rupert for some reason was terrified and cried the whole time! Ok, so I really enjoyed this!!! We woke up all fairly shattered from the busy day before so after a long lazy breakfast Caroline and I took the boys off to Wild Discovery which was located right behind our cottage. It's so cute - there is a farm yard where the animals just wander round, the bat house, exotics house and trail that you can walk through and see a variety of animals. The only problem for us is that it started pouring it down so we rained off early and went back to the cottage. It's a great experience though, especially for toddlers who can get close to their favourite animals. Back at the cottage we enjoyed a lazy day and later that evening ordered a Thai Takeaway from Orathai in Wrea Green. Our last day and we were so sad to be going home, there is still so much we could have done! Another perk of being in a Sapphire Cottage - you get to check out later - 11am. Which is great when you have seemingly exploded in to the place and have toys EVERYWHERE! Once we have checked out its time for Swimming - at busy times you have to call in the morning and book a slot, but when I called the receptionist said it was quiet so we just rocked up. I didn't go in as I was full of a cold but Nick and Caroline took the boys in. In 2017 they re-did the pool so it has two new slides and a new toddler/ splash area which is awesome. All in all we had a fab stay at Ribby Hall Village. We loved that everything was just so easy and self contained, so many activities and eateries within walking distance so no having to get in and out of the car all the time. There was so much to do that we could have probably spent a week there and not been bored. We loved the cottage and its location on Fisherman's Reach - I bet its amazing in Summer when you can sit out and have a BBQ. We also enjoyed the little perks of having a Sapphire cottage such as the late check-out and the coffee machine - we drink a lot of coffee!! If you wanted to stay at the same time this year the price is currently £499 for a Sapphire cottage that sleeps six people - thats for four nights, Monday - Friday on the 10th December. You can book online at www.ribbyhall.co.uk. If your children are under school age take advantage of the mid-week breaks as they are normally cheaper and the activities during the week are normally geared to pre-schoolers. If you want to ask any questions please do below!!! We made a TV advert!